Size: Adult - 1/4" - 1-5/8"
Identification: Small dark-colored beetles that hang around cow and other animal piles. They are usually shiny, brown or black and sometimes have a metalic-blue or purple luster. Males sometimes have a tooth-like projection on the back. Jaws are large and visible. Antennae are very short. Biology and Life Cycle: Tumblebugs roll manure into balls as large or larger than themselves. Female adults lay eggs in the balls and bury them to supply food for the larvae. Some adults dig burrows below the dung piles. Most dung beetles roll the dung in balls some distance from the piles. A single egg is laid in each dung ball. The larvae hatch and feed to the manure. The male helps in preparing the nest for the larvae. This is the only known case among insects where the male aids in providing for the young. Habitat: Soil under and near manure piles. 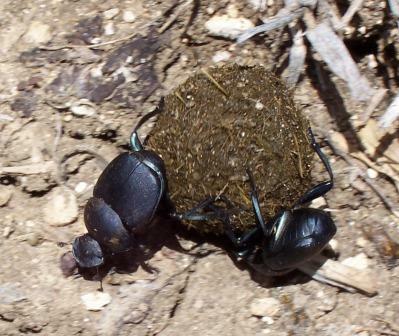 Feeding Habits: Scarab beetles feed on and dispose of fungi, decaying organic matter, dung and other organic materials. Economic Importance: Extremely important in the natural cycle of the breakdown of organic matter in the soil. Natural Control: Some species of click beetles, insectivorous animals, robber fly larvae, and fungi. Insight: There are at least 7,000 species. A few species are plant eaters and minor pests. Dr. Truman Fincher of USDA-ARS Food Protection Research Lab at College Station has spent a major portion of his career working with dung beetles here in Texas and in many other parts of the world. Truman Fincher calls the dung beetles nature's first sanitary engineers. By burying the poop they cause the following to occur: (1) rapid removal of dung from pasture surfaces so that it doesn't smother the forage or cause a foul area that livestock will not graze, (2) rapid incorporation of the dung into the soil where much less volatile nitrogen is lost to the atmosphere. This buried moist organic matter provides nutrients for teeming masses of microorganisms that turn it into rich, moisture conserving, healthy soil to grow more healthy, abundant, nutritious forage, (3) breaking the life cycle of many gastrointestinal parasites by burying the dung which is where the eggs and/or larval stages of the parasite normally incubate, (4) removing the breeding media (dung) for pest flies like horn flies and face flies, both which cause substantial economic losses in cattle production. The dung beetles aren't burying the poop as a favor to us and the cows. They are storing it for food and to provide a place for their eggs to hatch to be food for their larvae. The ancient Egyptians worshipped them. The "sacred scarab" can still be found in Egypt and surrounding countries. To the Egyptians, ball rolling symbolized the daily movement of the sun. The tomb of King (Tutankhamen) contained a pendant depicting the sun god Ra as a scarab beetle rolling the sun across the sky. We don't need to worship these lowly poop rollers, but they are magnificent creatures deserving of our respect.